You can’t hold it in; the pressure behind your nose is building and the bright sunlight is triggering a reflex, and try as you might you can’t hold it back… “ACHOO!” You sneezed! Quick, what happens next? Did your soul just leave your body? Did a demon slip inside you in a moment of vulnerability? Is someone gossiping about you? Are you going to die? Believe it or not, all of these questions were taken seriously at various points in history, all because of Sneezing superstitions. 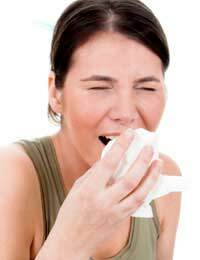 Sneezing is nothing unusual. It happens every day all over the world to countless people, and in many cultures the traditional response- delivered in most cases by reflex—is either “God bless you” or “Gesunheit.” The latter is a German and Yiddish word that means, roughly “better health”, and is meant as “good vibes” and a positive thing. A sneeze is often associated with sickness, so a wish for good health makes sense; the former, which is often shortened to “bless you”, however, might leave someone scratching their head. Why would a sneeze be a prompting for divine intervention? Because people used to worry that sneezing was a prelude to the soul leaving the body, and death. This idea- the soul leaving the body via a sneeze- was latter added on to with the idea that a demon or devil was able to enter the body right after a sneeze; likely the origin of this was during times when people still associated physical ills with demonic possession. A covering of the mouth would serve to both keep the soul in place and block any demon blitz, and the blessings of those nearby were added in for good measure. During the time of the plague when someone sneezed it could mean death- for those nearby. It is thought that saying “Gesunheit” back then was more a wish for good health for the person saying it, hoping they hadn’t just contracted their death. One fun local superstition in some parts of Germany has a sneeze occurring as a serendipitous affirmation of whatever was just said. If person A was complaining about the weather and person B sneezed, it would be seen as an agreement about the bad weather, and person A would say “You got that right!”. The interesting thing about a sneeze is that it "slows" down the heart for that moment, very, very unperceivably I may add!